Confession time: I really, REALLY like putting stuff in jars. Specifically, I love making jam. Every year, I pack the cupboard with micro batches of local fruit jam, my way of hanging onto the best parts of summer. Peach is the house favorite, but I’m partial to plum & cherry, as well. 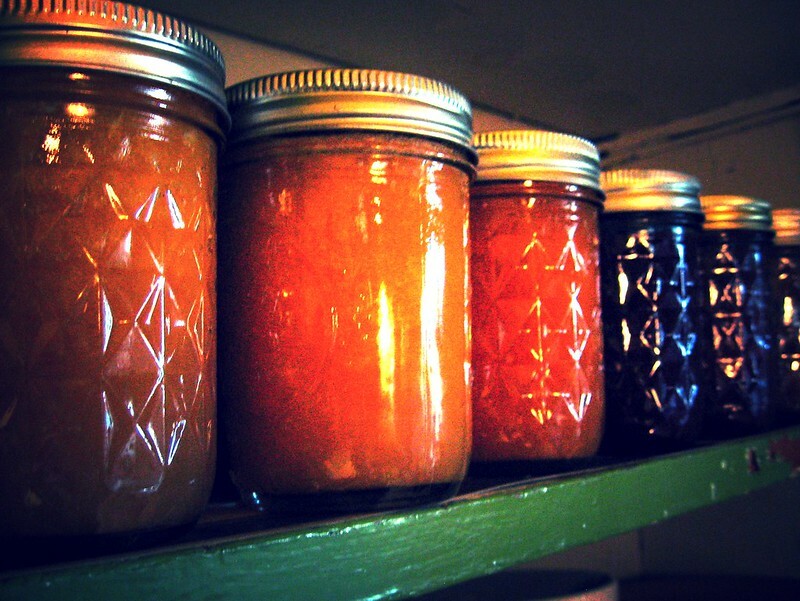 Home canning isn’t nearly as intimidating as I’d once thought, & discovering low-sugar pectin kind of rocked my world. But. We’re not here to talk jam. Not this day. It’s fall in south central PA, which means apples, apples, & more apples! A few weeks ago, Small Bear was invited to go apple picking with a friend, & came home with half a bushel of lovely local Yellow Delicious apples. Yellow Delicious aren’t my first choice of cooking apples – I tend to prefer the more tart varieties – but when life gives you an abundance apples, you go with it. 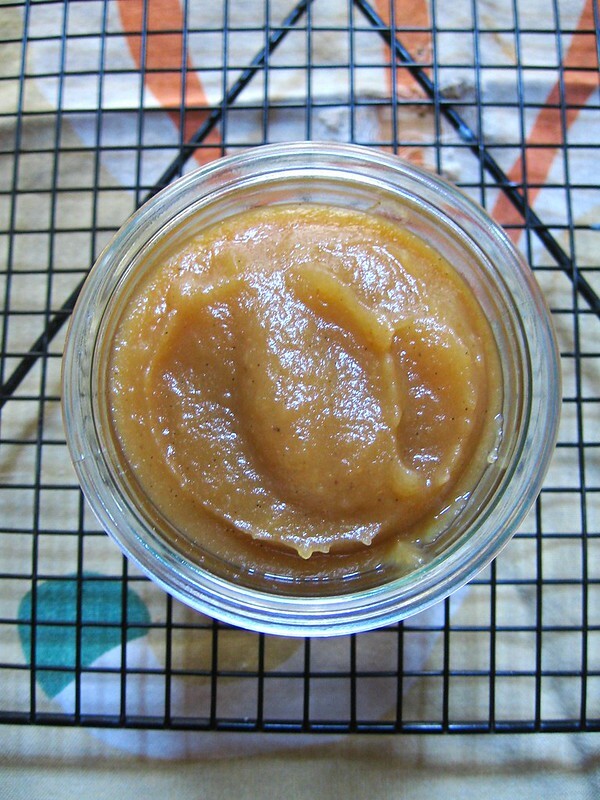 Applesauce is the usual method of preserving pick-your-own apples, which is a fantastic project for a Sunday afternoon. This year, I wanted something different. 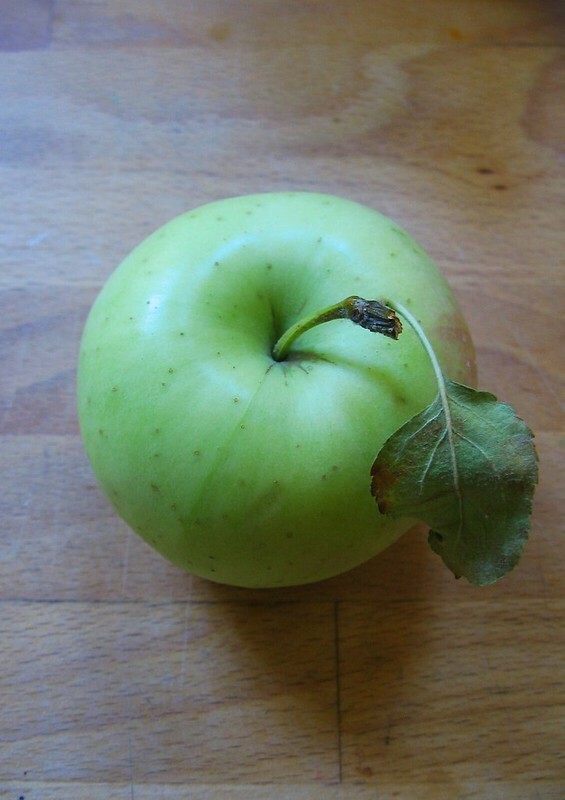 Something silky & luxurious & undeniably APPLE. This called for making apple butter. 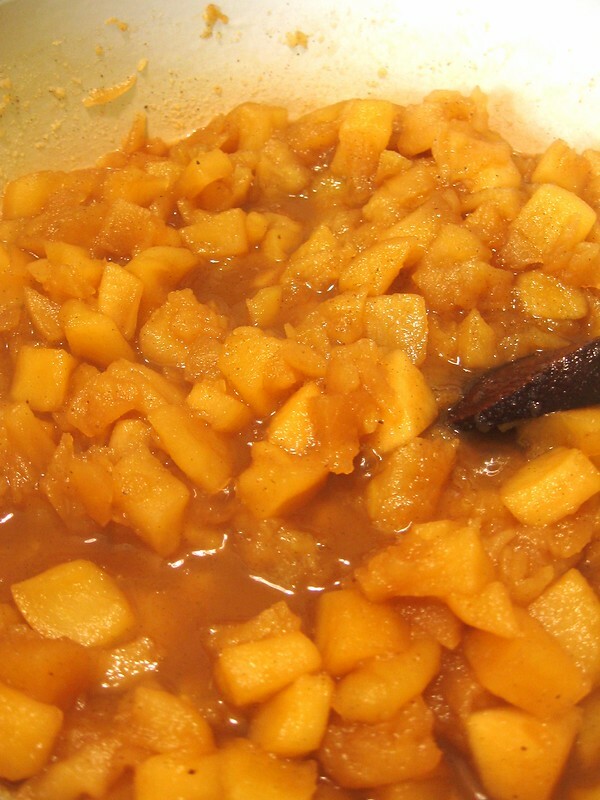 Apple butter is an ubiquitous part of fall in our part of the US. Thick, deep brown, & traditionally packed with spices, it gets cooked down for hours in open iron vats at apple festivals, scenting the air with clove & cinnamon & smoke. Here in Pennsylvania Dutch country, apple butter’s put on cottage cheese as a side vegetable (no, really), but it’s more commonly used in baking or as a spread. Personally, I love it with peanut butter on whole grain toast, or slathered over my pancakes. My main complaint with most apple butters, though, is that in the end, they don’t really taste like APPLES. Traditional recipes call for spiced cider, as well as a healthy measure of cinnamon & cloves. Tasty, but a bit of a sledgehammer of spices, if you ask me. I wanted something a little more sophisticated, so I started with Marisa’s basic fruit butter recipe & improvised from there. Combine all ingredients in a large, heavy bottomed pot (if you have a Lodge, this is the perfect project for it; you can also do this in a slow cooker). Cook over medium to low heat, stirring frequently over the course of an hour or two, until the apples have broken down and you can smash them easily against the side of the pan with your spoon. 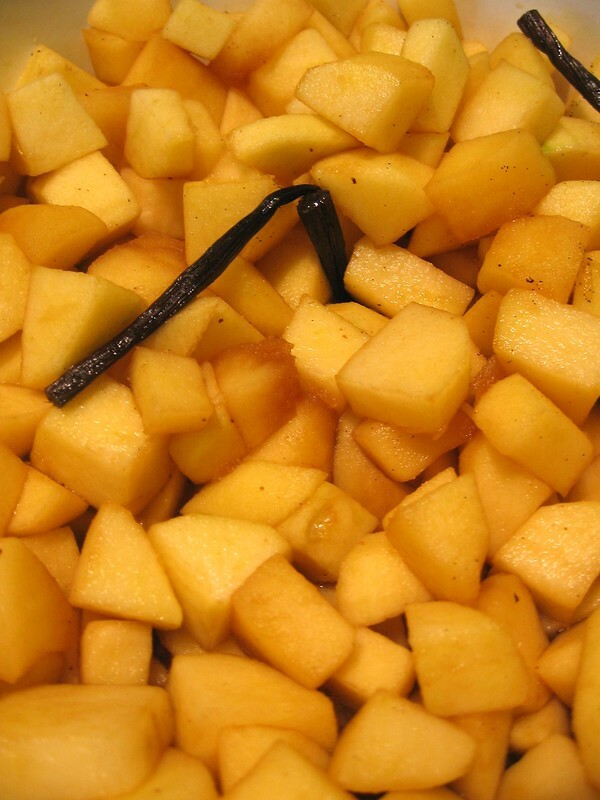 Turn off the heat, pick out your vanilla beans & stick blend your apples into silky unctuousness. (If you don’t have a stick blender, a food mill or food processor will do the job just as well, if a bit messily.) Continue to cook over low heat for another half hour or so, stirring more frequently than before as your butter will be more inclined to scorch as it thickens. Taste as you go, adding more sugar, lemon or spices as you feel necessary. Keep in mind that warm apple butter will taste sweeter/stronger than when it has chilled, but that the spices will continue to bloom as it sits in the jars on the shelf. Cook until you have a thick, cohesive sauce that leaves a pretty clear trail when you scrape the spoon across the bottom of the pot, & that stands up in peaks when dropped from the spoon back into the pot. Do a final taste for sweetness, & voila! Apple butter that smells – & tastes – like heaven, not a cinnamon stick billy club. … you make Tomato Bread Salad. 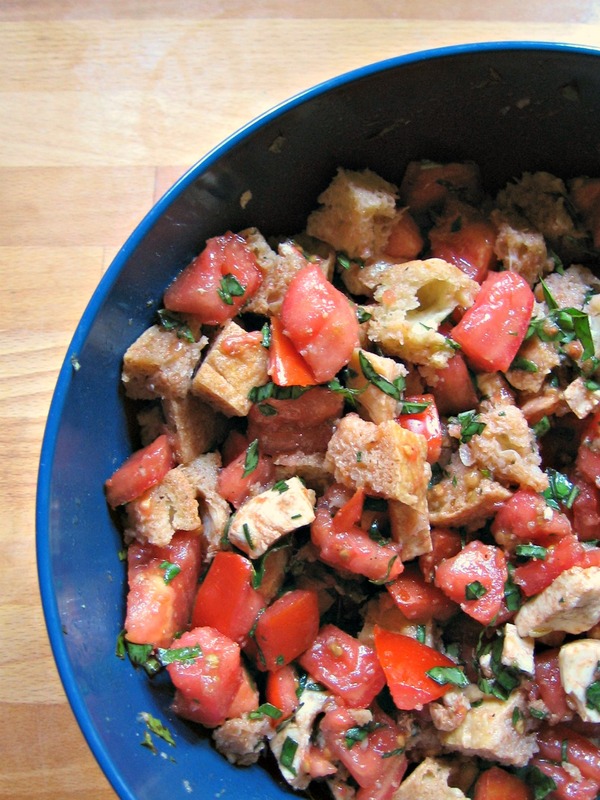 Tomato Bread Salad is one of those beautifully simple dishes that screams SUMMER. Made in winter with mealy tomatoes & vapid basil, it’s thoroughly depressing. But use heirloom tomatoes & herbs cut fresh from the garden & you have something transcendent. Traditionally, one uses day-old bread that’s gone a bit hard & stale. That… doesn’t happen much in our house, so I dice a fresh chunk of something crusty & par-bake it so it’s a bit crisp. This helps the bread hold its shape once immersed in the juicy tomato mixture. Cut or tear the bread into bite-sized cubes, spread on a sheet pan, & bake at 350F til just starting to color at the very edges. Let cool while you assemble the rest of the salad. 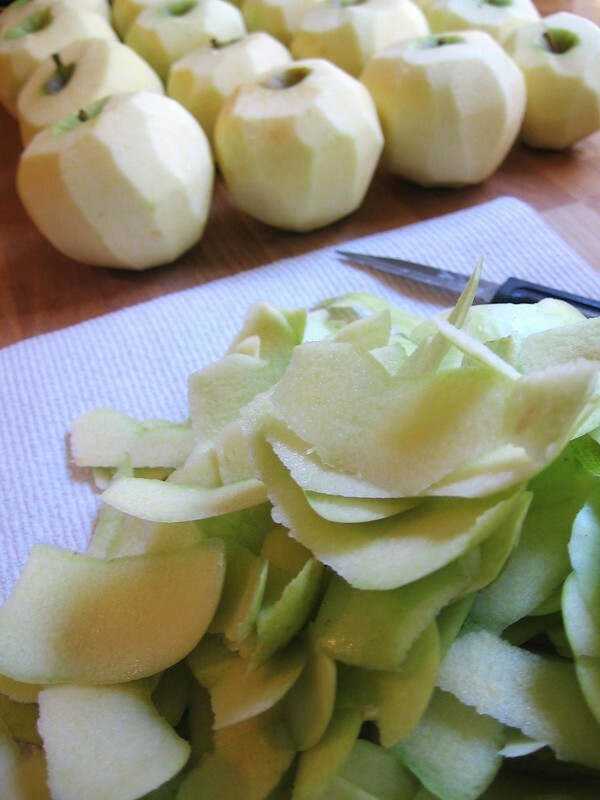 Cut the tomatoes into 3/4-inch cubes & transfer to a large bowl, including any & all juices that may have escaped. Slice the mozzarella 1/4-inch thick & cut into quarters (just quarter the bocconcini if using that) & add to the bowl. De-leaf the basil stems, stacking & thinly slicing the leaves into a fine chiffonade. Add to the tomatoes & cheese along with the remaining ingredients. Toss gently to combine. Let marinate at room temperature for about 10 minutes, then taste for seasonings. About 5 minutes before serving, fold in the crispy bread pieces & let the bowl sit so the bread starts to absorb the juices. Revel in the crispy, chewy, juicy, garlicky awesomeness. Oh Daylight Savings Time, you arcane & double-edged sword. While the extra light in the evenings will be lovely, I’d really started to enjoy getting up with the sun, instead of before it. Springing forward does have its benefits, though, the most obvious being that it heralds the end of winter. I love winter, really I do, but this year I am more than a little pleased to see the arse end of it. See, I had this notion back in the fall to really step up the local & seasonal produce in our diet. It made sense from both a financial perspective & an environmental one – why on earth was I shelling out for Chilean-grown red bell peppers in the middle of December? The quality was never fantastic, the price was at times horrific, & it embarrassed me more than a little to think of the food miles involved. I made a few exceptions from the start: fresh salad greens (though we did favor spinach heavily, cooler-weather crop that it is), hot-house cucumbers (my weakness), tinned & frozen vegetables, & frozen fruit. The rest of our produce-buying was limited to the quintessential winter vegetables (roots, alliums, brassica, hardy greens, mushrooms). We went for organic, locally-grown, or both as was available. 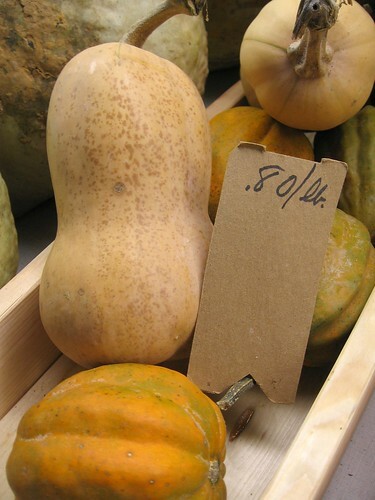 The bulk of our shopping was done at the local farmers’ market, & each week I asked what produce was local (not an idle question – a good bit of market produce is shipped in from warmer climes). I might be a bit biased, but we ate exceptionally well this winter. Limiting the fresh ingredients I had to work with forced me to get far more creative than if I’d had peppers, squash, fresh berries & tomatoes to fall back on. At no point did I feel like we were sacrificing anything – we had lush curries, savory pies, all manner of Asian-inspired meals & easily a dozen different soups. The salad greens & cucumbers satisfied our cravings for cool, fresh things, & the occasional smoothie (with frozen berries, bananas & mangoes) provided a welcome fruity treat. We also saved a fair amount of money – I’m not organized enough to be able to give an exact amount, but our grocery bills were definitely smaller this winter. Some of that is due to the deliciously economical root veggies I stocked up on every week, but not buying tomatoes at $4/pound definitely helped. We’ve also lost weight. Jesse’s been hitting the gym more often this winter, but I’ve been just as meditative as ever (yes, that’s what we’re calling it) & have misplaced several pounds. I’m blaming the ridiculous amounts of orange & deep green veggies we’ve been eating, & the fact that we haven’t craved the usual stodgy winter classics (mac & cheese, mashed potatoes, half a loaf of bread) nearly as much this year. But what I wouldn’t give for a bowl of fresh garden peas & a punnet of red raspberries right now. Clearly, the body is ready for a change of seasons. Before the delicate spring vegetables start appearing at market, I’ll post a few of our favorite meals from this winter: The Cheapest Soup Ever; tofu & butternut curry; & fish not-pie. 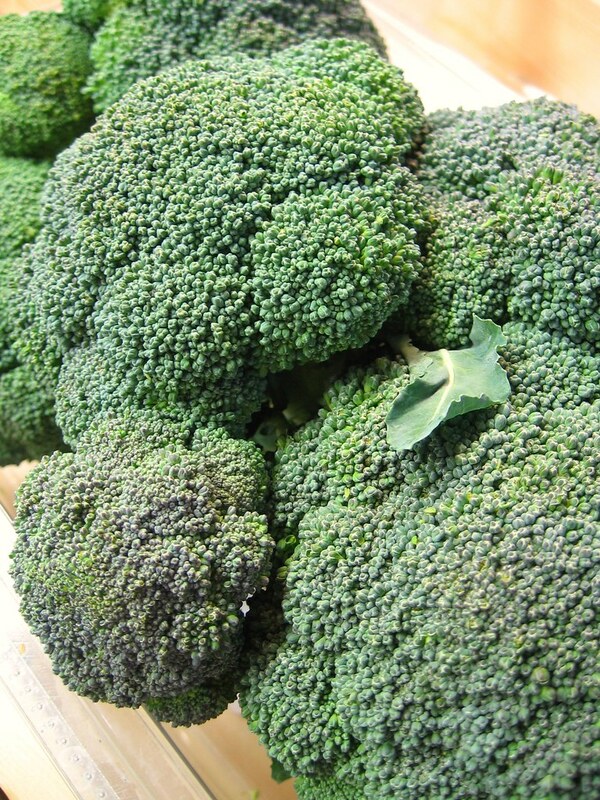 See what’s in season in your neck of the woods, & let me know what you’ve been making with it. :sigh: All in good time. All photos taken by me, at Central Market House. Here’s the thing: I adore eggs. They are versatile little ovals, lending themselves as much to last-minute dinners as to towering desserts. 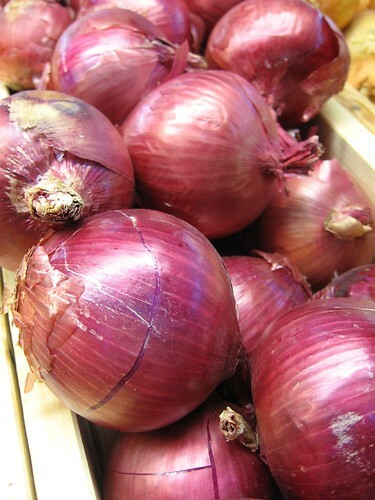 They are easy to find, keep for ages in the fridge, & are a great source of protein. But, they are also beautiful. We have the incredible fortune of living in a city surrounded by farmland, & my husband works with a man who tends a decent flock of laying hens. Just about every week from mid-March through October or so, Jesse comes home with a box of free-range eggs. 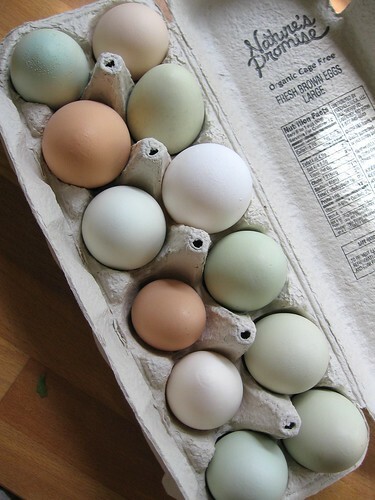 Pictured here is our first dozen of 2011, & if their beauty is any indication, it’s going to be a wonderful year. So, for now, we content ourselves with what eggs we are able to find locally. When there are no eggs to be had in the office fridge, we buy from Dietz Produce, one of our favorite vendors at Central Market House. Dave raises his own chickens & often has eggs available, but his hens sometime prove too tempting to the local foxes, so he also carries cage-free & free-range from Apple Valley Creamery. In a pinch, we’ll buy organic eggs at the grocery store. 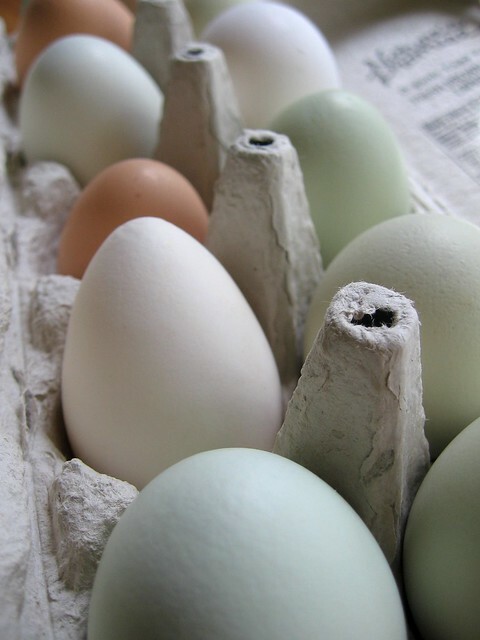 All are perfectly tasty & a vast improvement over the watery & anemic-yolked factory-farmed eggs. I won’t go into the misery inherent in mass-scale poultry farming in this post. Suffice to say, our eggs come from chickens who run free in their yards & houses & who might know the pleasure of a warm summer day, & for my money, happy hens lay delicious eggs. These beauties will, for the most part, be fried up for breakfasts & make their way into pancake batter. I’m always tempted to keep the shells, especially the blue- & green-tinged ones. These come from Araucana hens, lovely docile birds & reliable layers. 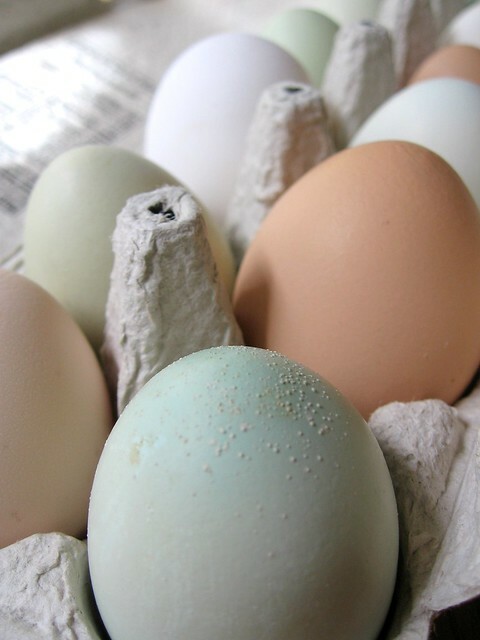 The nubbles are calcium deposits – these frequently appear from hens that are just starting to lay after a dormant period. Set a medium non-stick pan over medium heat. Butter one side of the bread & use a circular cutter or a small serrated knife to cut out a 2.5-inch round from the center. Add the remaining butter to the pan, swirl to coat the pan, & wait til it just stops sizzling. Add both pieces of bread, non-buttered side down, with the extra round of bread to one side of the pan, & crack the egg into the hole you’ve cut in the main slice. Give the yolk a poke or two with your spatula, if you don’t like your egg yolk oozey. Cook til the bottom of the bread has lightly browned & the egg has started to set – the top layer will still be a bit runny. Carefully but quickly flip the bread-&-egg slice over, & flip the extra bread round, too. Cook til the bottom of the bread has just browned & the egg is mostly set. (Lower the heat & cook a bit longer if you want your egg cooked firm.) You’ve now got a browned, buttery slice of fried bread with an egg cooked perfectly into the middle, & a crispy extra round to dip into the yolk. Slide your bird’s nest onto a plate & eat it while it’s hot. Our son likes his drowning in ketchup; I like mine with a sprinkling of dill & extra salt & pepper. Not fancy food, no, but it’s quick & tasty, & it makes the most of fresh eggs & good bread. You don’t have good bread in the house? I’ll share my secrets for making your own in the next few days… it’s easier than you think. And yes, butter. I’ll get my rant against margarine in at some point, don’t you worry. Random link: The University of California has a nice little PDF doc with some interesting egg FAQs.